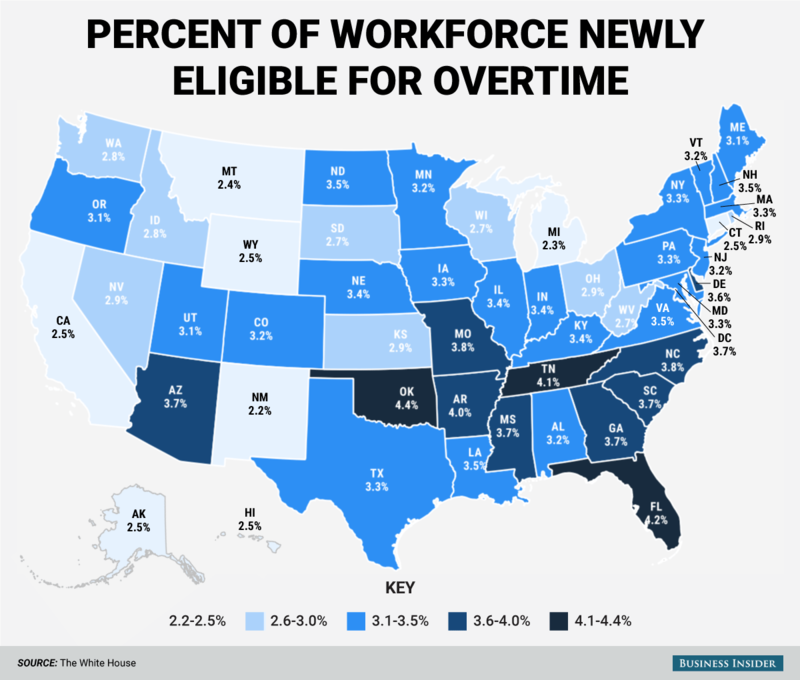 The Administration’s final overtime rule, published on May 18th, will make an estimated 4.2 million new workers eligible for overtime pay. Salaried workers, making up to $47,476 annually, will get time-and-a-half payments for work over 40 hours in a week. The effective date is December 1, 2016. In response to the President’s memorandum, Department of Labor issued the proposed rule on July 6, 2015. The final rule was issued on May 18, 2016 and can be found here. (3) the employee’s job duties primarily involve executive, administrative, or professional (EAP) tasks. Since 2004, that salary threshold was set at $23,660 per year. The new rule more than doubles the threshold to $47,476 per year. Employees in executive, administrative, or professional positions making less than the increased salary threshold will not meet this exemption and thus must receive overtime pay. Furthermore, the salary threshold will automatically update every 3 years beginning on January 1, 2020. The 508-page rule addresses many of the more than 270,000 comments received including specific comments made by WIPP. WIPP advocated for an exemption for small businesses. The DOL recognized WIPP’s concerns, but concluded that their final salary threshold would “provide relief” as it is slightly lower than the $50,440 that was originally proposed. While the salary threshold is lower than estimated, it is still double the current threshold. WIPP’s also commented on the difficulty of tracking employee hours to ensure compliance. This comment was also recognized by DOL, but they did not address this concern in their final rule. The Fair Labor Standards Act, which governs the overtime rules, includes a carve-out for businesses that have less than $500,000 in annual revenue and do not engage in interstate commerce. However, DOL guidance suggests that the interstate commerce requirement is likely met by most businesses. DOL has published additional information on these changes here. Please reach out to WIPP’s Government Relations team at advocacy@wipp.org with any questions. This entry was posted in labor, Regulations and tagged Department of Labor, overtime, overtime pay, overtime rules, workforce by Women Impacting Public Policy. Bookmark the permalink.